Turquoise waters, white sand beaches, music, people... Discover special packages and excursions to explore beautiful places in the Caribbean islands. Discover peak paradise with a cruise to the Caribbean. Glittering turquoise waters, shimmering white-sand beaches, and more than 700 different islands await you in this tropical vacation destination. You can relax and unwind on a sunny beach, stroll through quirky local markets and shops, and take in the colorful colonial architecture over the course of your cruise. Whether you dream of snorkeling among colorful coral reefs, hiking through rainforests to discover ancient Mayan ruins, or sampling the local flavors in a tropical fruit smoothie or a bottle of rum, you can do it all on a Caribbean cruise. 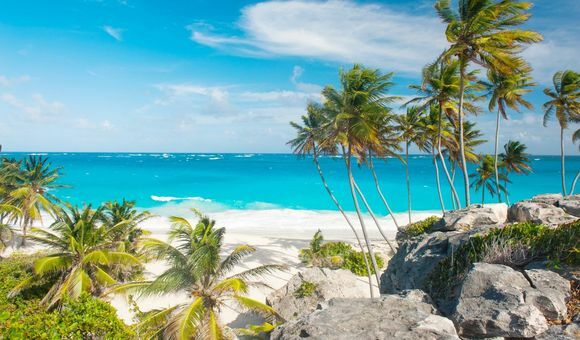 The Caribbean is home to some of the top vacation destinations, including Mexico, Cuba, and the Bahamas. Whether you're looking for a short getaway or a relaxing two-week vacation, Dreamlines can help you find the cruise itinerary that's right for you. With cruises departing from Miami, Fort Lauderdale, and more, the Caribbean is an easy-to-reach destination, making it the perfect choice for your dream vacation. Named after the Mayaimi tribe that inhabited the area in the 1600s, Miami has skyrocketed to international recognition as the cruise capital of the world. Nestled between Biscayne National Park and Everglades National Park, the incredibly diverse tropical metropolis is equally acclaimed for its stunning sandy beaches, extravagant party scene, street art, natural beauty and glittering skyline. Vibrant, classy, edgy, exciting – Miami is everything you want in a cruise destination and more. San Juan is the capital of Puerto Rico and sits on the Atlantic coast of the tropical Caribbean island. The city is renowned as a historical wonderland and mosaic of culture and the arts, with its colonial-era architecture, quaint old town and vivacious street art. Stroll the timeworn 15ft-thick walls guarding the harbor, relax at Isla Verde’s picturesque beach or dine at one of the superb restaurants in Santurce. Cozumel, a tropical island located off the eastern coast of Mexico’s Yucatan peninsula, is one of the world’s top cruise destinations. With its glittering turquoise waters, bright white beaches and exotic marine life, the idyllic island is popular for snorkeling, diving and swimming with dolphins. Cozumel has a well-established tourist industry. Cruise passengers will have plenty of opportunities for water sports, nature exploration and nightlife. Year-round temperatures in the upper 70s make it the perfect place for a sunny beach vacation. Bridgetown is the capital of Barbados and is located on the southeast coast of the exotic Caribbean island. The lively city center is a melting pot of the old, new, historic and nouveau, and was recently named a World Heritage site by UNESCO. A popular beach destination by day, cruise visitors can also enjoy Bridgetown’s fresh seafood, fantastic bar scene and vibrant nightlife. Philipsburg is situated on the narrow stretch of land between the picturesque Great Bay and the Great Salt Pond, on the tropical Caribbean island of Saint Martin. Just four parallel streets wide, Philipsburg is a shopper’s paradise, renowned for its mile-long tax-free shopping district just a stone’s throw from the port and beaches. Castries is the capital of St Lucia, a teardrop-shaped island in the northwest Caribbean Sea. Surrounded by dramatic mountainous landscapes draped in lush subtropical rainforests, St Lucia is a top destination for nature lovers and bird watchers. Many a writer has been inspired by the beauty of this mysterious island, including Derek Walcott, a Nobel Prize winner for literature. Nassau is the cosmopolitan capital of the Bahamas and the picturesque Caribbean island archipelago’s only city. The tropical metropolis is the spirited alter ego of the Bahamas’ customarily chill personality, drawing cruise passengers in the millions with its teeming culture districts and vibrant nightlife. Cruise to the Bahamas to enjoy Nassau’s colorful colonial infrastructure, pristine beaches, and excellent duty-free shopping. Charlotte Amalie is the largest cruise port on Saint Thomas. A colorful Caribbean island, it is known for its Danish colonial architecture, sweeping beaches, and lots and lots of shopping. Charlotte Amalie was once a popular pit stop for pirates. Seafarers from all over the world would stop by its beer halls to quench their thirst after a long stay at sea, and it's said that Bluebeard and Blackbeard frequented the city. Today, visitors can still partake in this nautical tradition by sampling the island's excellent selection of rum. South America's most popular cruise port, Cartagena is a must-see stop on any Panama Canal or southern Caribbean cruise. The city is safe and tourist-friendly, and most tourist places will speak English and accept U.S. dollars. Beautiful parks, museums and shops welcome visitors, and beautiful Spanish cathedrals and castles lurk around every corner. For beach lovers, there are plenty of sandy beaches and coral reefs within easy access of the city. And for shopaholics, kiosks and tourist shops dot the inner city. Visit the Chocolate Museum and see how Columbian cocoa becomes artisan chocolate – great for families! Oranjestad is the charismatic capital city of Aruba, situated in the southern Caribbean. The city is renowned for its colorful colonial architecture, excellent duty-free shopping, and lively nightlife. Teeming with parks, idyllic beaches, and picturesque trails, the charming island town is best discovered as the local Dutch do – by bicycle. Key West is the southernmost point of continental United States. Connected to the mainland by the iconic 113-mile Overseas Highway, the tropical oasis lures visitors with its pristine beaches, stunning reefs, literary festivals, edgy nightlife and romantic, pastel-colored Caribbean villas. The array of contrasts makes Key West an intriguing cruise destination teeming with cultural finesse and tropical flair. Willemstad, officially part of the Kingdom of the Netherlands, is the capital of Curaçao. The southern Caribbean island city is a popular cruise destination due to its vividly colorful colonial architecture, fantastic weather and café-lined waterways which make Willemstad feel more Dutch than Caribbean. Picturesque beaches just outside the city lure sun-starved Americans en masse, as do the crowded streets of Punda, teeming with art galleries, boutiques, and excellent duty-free shopping. Basseterre is the bustling capital city of St. Kitts and Nevis, situated in the eastern Caribbean. The tropical city is teeming with historical sites and architectural gems and hosts a vibrant downtown next to the cruise ship terminal which is renowned for excellent duty-free shopping, souvenir stalls, and cocktail bars. Venture outside the city boundaries to enjoy a variety of water sports, such as kiteboarding, jet skiing, diving, snorkeling, surfing, sailing and more. Located on the western coast of Grand Cayman Island, George Town is one of the most popular cruise destinations in the Caribbean. The cosmopolitan Cayman Islands’ capital is renowned for fantastic shopping and an eclectic history as the home of pirates, shipwrecked sailors, and deserters from Cromwell’s army in Jamaica. George Town is a haven for beach lovers, with some of the island’s most exclusive resorts located at picturesque Seven Mile Beach. The Costa Maya is a beautiful, 100-mile-long coastline on the Yucutan Peninsula characterized by white sand beaches and beautiful blue water. Right on the port you can find shopping areas, restaurants and bars, and jet skis for rent, and the nearby city of Mahahual holds a popular, easy to access beach. For those looking for a more private piece of paradise, the more secluded beaches are just a short taxi ride away. One must-see for any visitor of Costa Maya is the Chacchoben Ruins, the remainders of an ancient Mayan city more than a thousand years old. For the best experience, take a guided tour to learn about what life was like for the Mayans – back then and now. The Caribbean is known for its gleaming blue lagoons, soft white-sand beaches, and year-round tropical weather. Friendly locals and a laid-back vibe make it the perfect choice for a relaxing vacation, and you'll quickly get used to life "on island time." No matter where you go, you'll find beautiful sweeping beaches, stunning crystal waters, and plenty of opportunities for snorkeling, swimming, and sunbathing. Caribbean cruises: Where to go? The Caribbean is divided into the Eastern, Western, and the Southern Caribbean, each with its own unique culture and attractions. On a Western Caribbean cruise, you'll call at ports in Mexico, Central America, and the Bahamas. The Western Caribbean has some of the best snorkeling, scuba diving, and diving in the world. The Eastern Caribbean is a shopper's as well as a beach lover's paradise, with lots of opportunities for souvenir hunting as well as sunbathing at Saint Thomas, Saint Martin, and Saint Kitts. The Southern Caribbean is more popular for experienced cruisers. Here, passengers can look forward to exotic and beautiful destinations such as Aruba, Barbados, and Curacao. To learn more about different Caribbean cruise destinations, check out Dreamlines guide to cruising the Caribbean. The Caribbean and especially the Bahamas are the perfect destination for a short, three-day getaway. Perhaps you're dreaming of a winter escape? Check out our selection of four-day cruises. A short cruise can be the perfect way to relax and reset over an extended weekend, or to see a new part of the world without breaking the bank. If you'd like to truly experience the destination, however, consider going on a longer cruise. You'll need at least seven days to experience just one region in the Caribbean, and 10 or more days to see more. The Caribbean is also a popular destination for families. A favorite destination for family-friendly cruise lines such as Royal Caribbean, Carnival Cruise Line, and Disney Cruise Line, a Caribbean cruise has something for everyone to enjoy. In addition to all the major ports in Florida, Caribbean cruises also depart from New Orleans, New York, and Galveston, Texas. Southern Caribbean cruises typically depart from San Juan, Puerto Rico. The Caribbean is also a popular stop on a Panama Canal cruise. To stay up-to-date on the latest hot deals and special offers, check out Dreamlines' selection of cruise deals. You may even find a last-minute deal or a major discount. Or, simply call one of our cruise experts at 1-888-403-1425 and they'll be happy to help you find the best deal on your Caribbean cruise.